Over the past couple of years, I had heard good things about Echigo, and always wanted to try it, but there was never really anything special about the place that would put it at the top of my "to-eat" list. So what brought me here? Simple: my dining companion wanted to go. The word on the street is that Chef Toshi used to work under Nobi Kusuhara (of Sushi Sasabune fame), so I was expecting a similar experience, warm rice and all. Echigo is located on the second floor of a strip mall. One big advantage: parking is free and plentiful. The bar seats about a dozen. 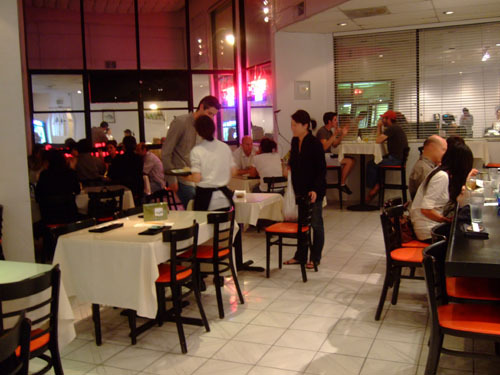 High ceilings give the place an airy, spacious feel, which is atypical of most sushi joints. Decor is nondescript. Echigo presents a good selection of sushi items, and as you can see, there are no fancy Super-Crunchy-Philly-Dragon-Fire rolls here. 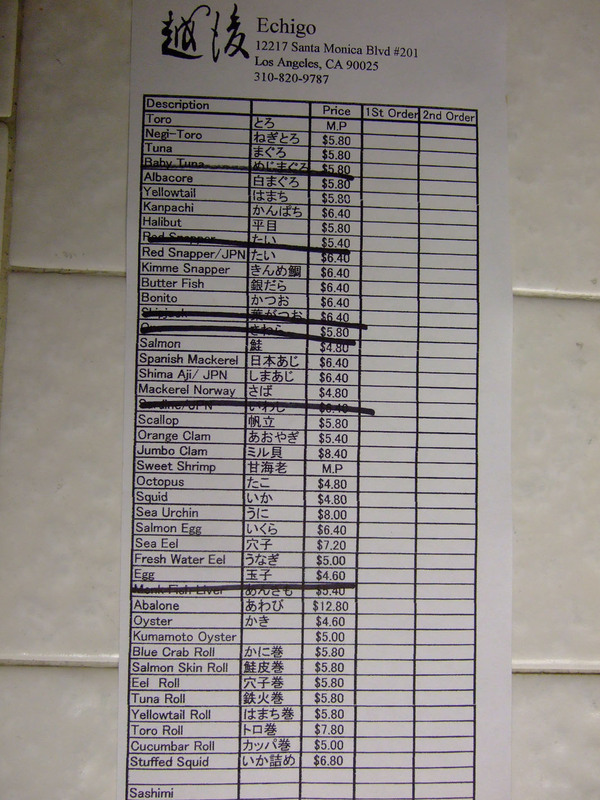 At the bar though, only omakase is available, at a cost of $44.10. Click for a larger version. 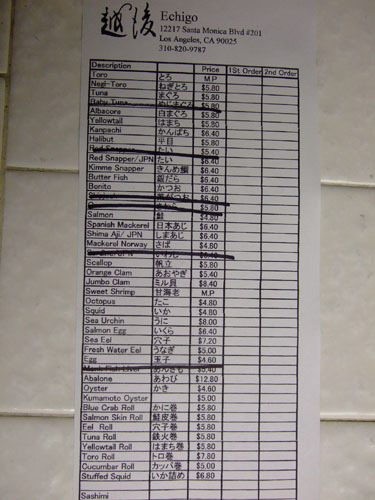 A small list of beer and sake is available. We ordered a decanter of Kubota [$31.00]; I'm not sure if it was Kubota Manjyu or the lower-end Kubota Hekijyu, but we liked its light, floral flavor. The plum wine [$6.00], however, was far too sweet, and my dining companion had to water it down. Click for larger versions. 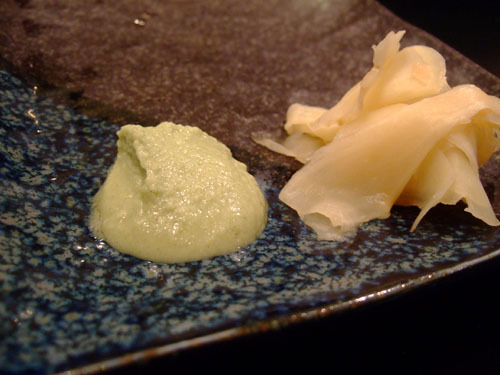 The wasabi may have been the real deal, but was a bit creamier than I'm used to. The gari (ginger) was quite good, crisp and very natural tasting. The tai was light, crisp, and overall quite tasty. 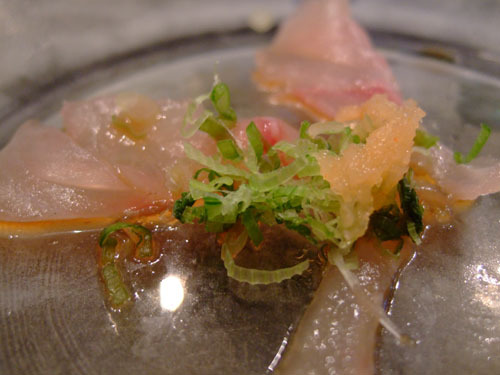 The addition of ponzu, scallion, and daikon oroshi helped draw out the flavor of an otherwise very mild-tasting fish. When it comes to toro, I think I've been spoiled by Urasawa and places in Japan. 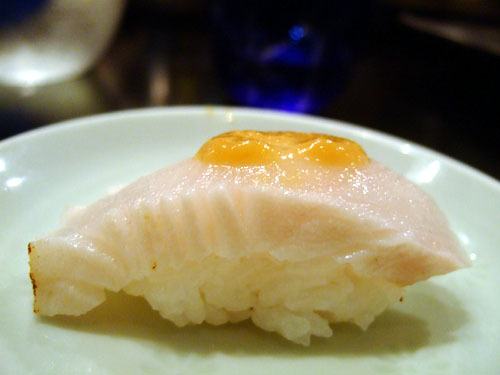 The cut here was unimpressive, lacking the fattiness and melt-in-your-mouth characteristics that I cherish in toro. The fish by itself was good but a bit forgettable. However, topping the hirame with ponzu, scallion, and daikon oroshi definitely heightened my enjoyment of the dish. 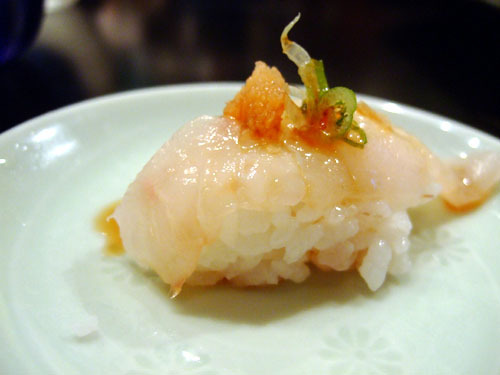 From Japan, topped with scallion. 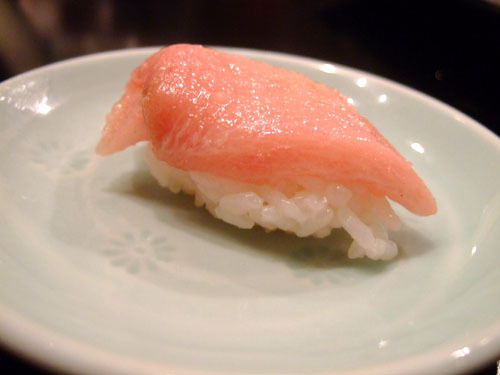 Katsuo is a relatively rare fish to get; I've only had it on my first visit to Urasawa and at Kyubey in Tokyo. That's a shame, because the bonito was arguably my favorite fish of the night. 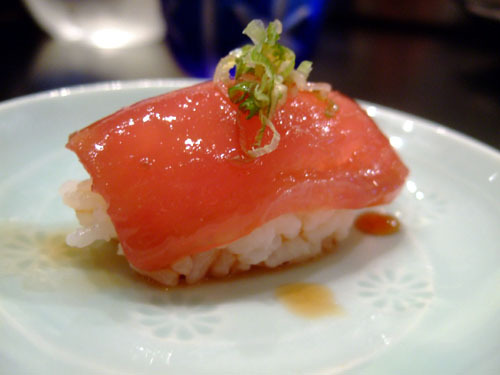 It was very soft and slick in consistency, with a more full-flavored, smokier taste compared to regular tuna. The kampachi here reminded me of hamachi. It was served with yuzu kosho (a condiment made from yuzu, chili peppers, and salt), which added a bit of kick to an otherwise pleasant but pedestrian fish. 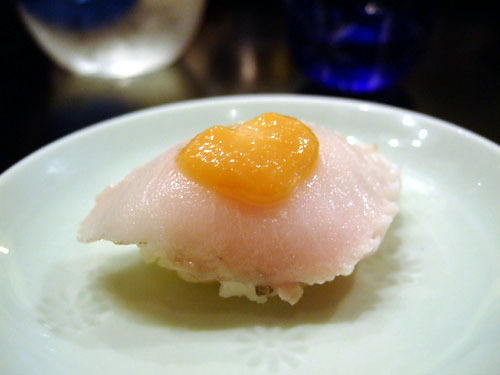 I loved the shima aji on my last visit to Urasawa, and once again the fish was one of the strongest of the night. In fact, I think it would've been fine without its various accoutrements, to let the fish's flavor really come to the fore. 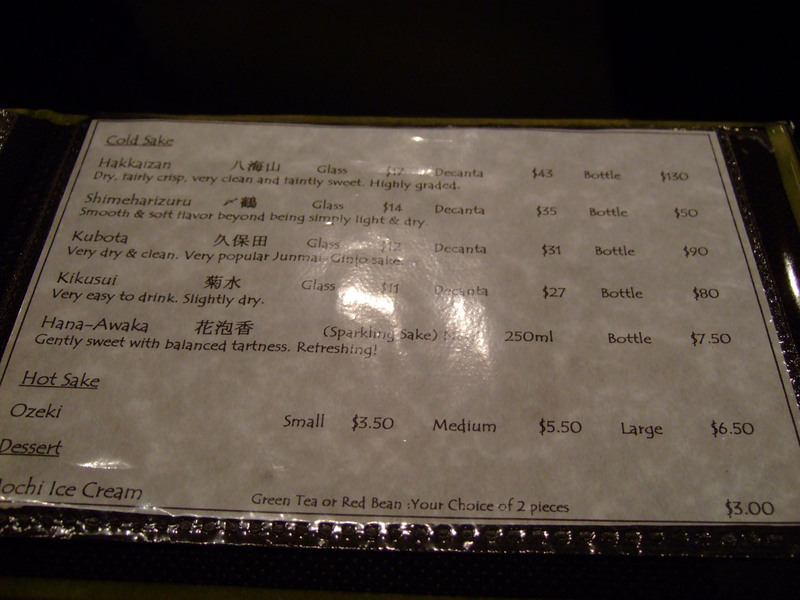 Compared to the tai above, this version was from Japan (and thus a bit pricier on the menu). I didn't notice anything particularly special about the fish however. 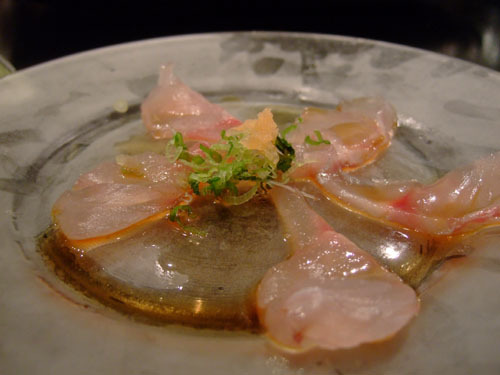 Perhaps some ponzu would better draw out the subtle flavors at play here? 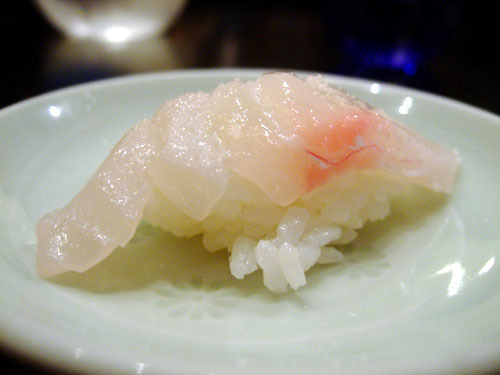 The term "butterfish" is often use to refer to many kinds of fish; here, I believe it was sablefish, or black cod. 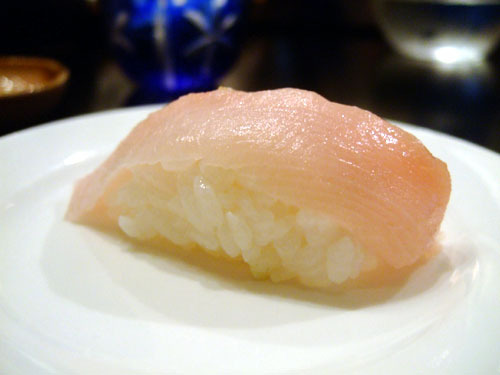 The fish had a very firm texture, a bit like albacore, while the taste was indistinctive. I'm not sure what the sauce on top was, but it had a slight citrusy note that helped offset the monolithic nature of the fish. This is just like the hand roll you can get at Sushi Sasabune or Sushi Wasabi (also run by an ex-Sasabune alum), though I would've liked more crab. 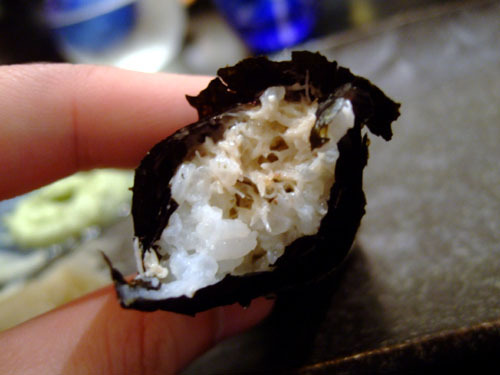 Nevertheless, it was delicious, with the strong essence of crab meat buffered by the rice and nori wrapper. Given the small cuts of fish and the relatively low number of courses, I was not close to being full. My dining companion was however, so we decided to order "only" four more supplemental courses. 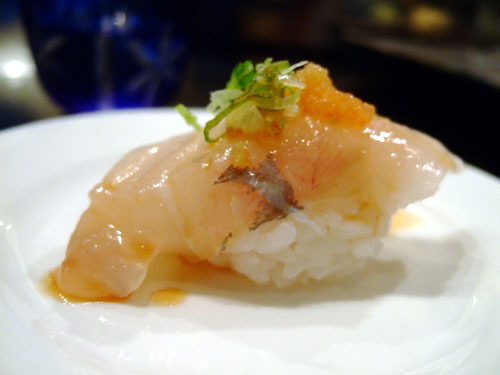 When I first started eating sushi, hamachi was arguably my favorite fish. 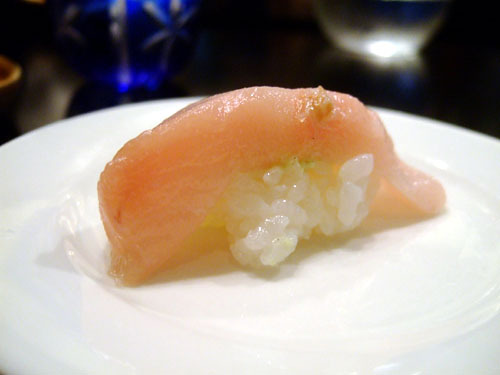 As I became more accustomed to sushi however, yellowtail began to fall out of favor. This reminded of why I liked it in the first place. 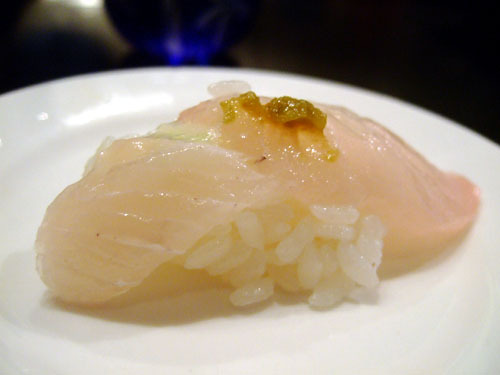 It was clean, mild, light, and as melt-in-your-mouth as hamachi can possibly be, without being too oily or heavy. 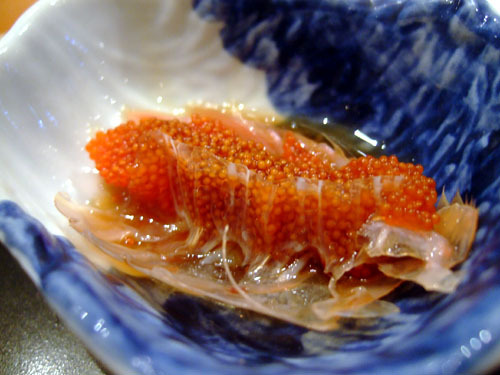 Before the actual sushi came out, we were presented with the shrimp roe. I was disappointed that we weren't given the deep fried heads though. The shrimp itself was very rich and creamy, but lacked the crispness and snap that I like. The awabi sashimi was one of the better versions I've had, as the flesh had just a hint of crunchiness to it (often times abalone is far too tough, like at Sushi Wave). 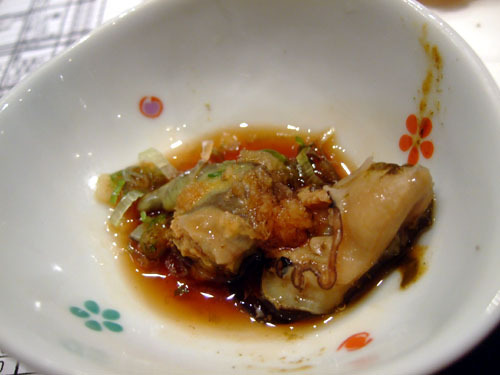 The second photo shows what was described as "abalone belly." I can't seem to find any references to it, so I'm really not sure what it was. My dining companion did prefer it to the actual abalone itself though. 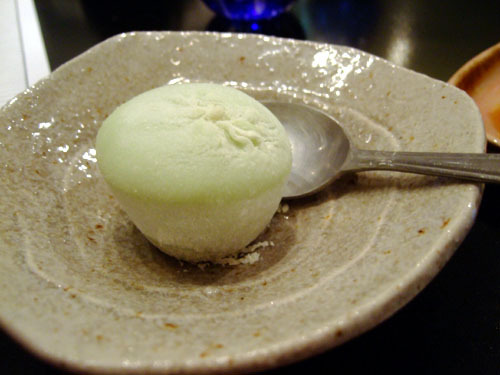 This looked and tasted suspiciously like the mochi ice cream available at many grocery stores, manufactured by Mikawaya. 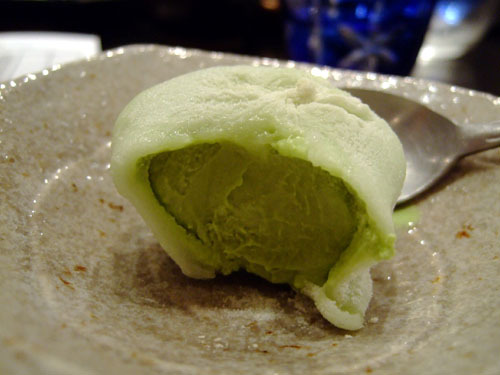 Mikawaya was the first company to manufacture mochi ice cream in the US, starting in 1994. Given that a 6-pack retails for $6.00, $1.50 actually wasn't a bad price. 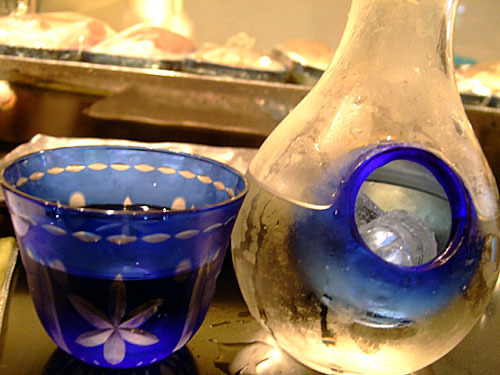 Echigo is often compared to Sasabune, and with good reason. Toshi has brought along his former employer's tricks, and has added a few flourishes of his own. 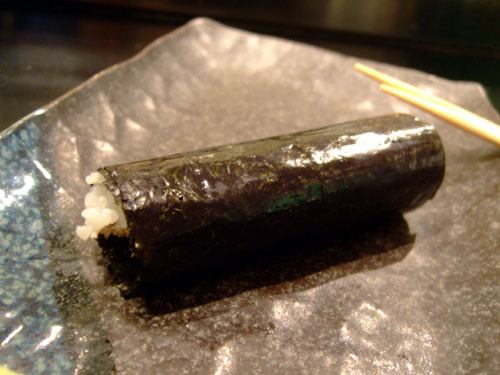 The sushi is good, solid, and reasonable in price, but it's not mind-blowing. So come on over if you're seeking a Sasabune-esque experience at a more intimate location, and perhaps at a slightly lower price point. Do watch out for the so-called warm rice though, as here it gets downright hot! what a deal for $44! It's great if you have a small appetite (like my dining companion), but if you're like me, nine courses just isn't enough. I could've gone through three of those omakases! Hey! 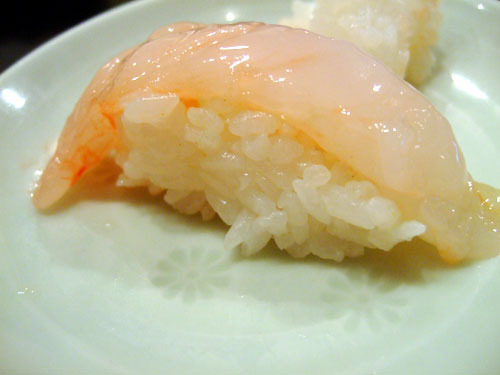 So I need a sushi suggestion! I haven't been to too many places..mori, zo, sasabune..to name some. I would LOVE to go to urasawa..but not yet =P Any other suggestions? You know your sushi it seems! You've pretty much hit all the best spots. 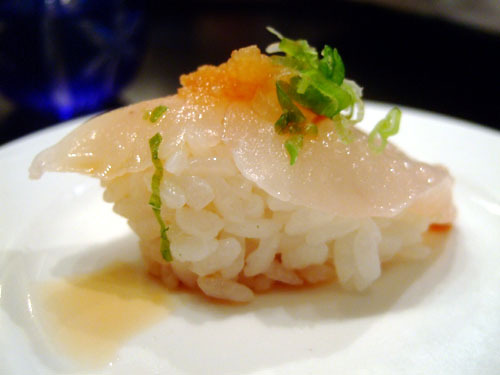 Then there's always Katsuya, but if you go there, I'd go to the original location. I haven't been to the new ones, but I heard they're more about the scene than the food. 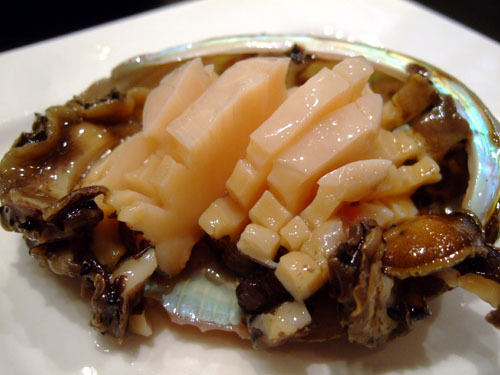 The "abalone belly" is really just the innards of the abalone, most notably the liver. I have always appreciated how he serves it with the abalone at Echigo, because it's my favorite part. By the way, since this is my first comment, I just want to say great job with all your reviews...I found your site through some of your posts on Chowhound, and I've learned a lot about all the restaurants I haven't been to (and some that I have). Scott, thanks for the clarification, and I'm glad you've been enjoying my reviews. oh, but i AM going to urasawa next month!! you must have a good job..to go eat at all the nice places..lucky you! I think I'm going on the 4th, though I'm not quite sure yet. My job is ok; actually I need find a new one! Hey great post it never ceases to amaze me how you and Tangbro have so much knowledge and things to say about fish, their texture, the taste everything!! You must share with me when we go to Urasawa!!! Where did you get the bibimbap? How was it? Dolsot? dhkm, I've not tried Kiwami yet. Compared to the glitz and glamour of the new Katsuya locations, this more intimate setting sounds like a breath of fresh air, a return to his more traditional roots. Have you been there? 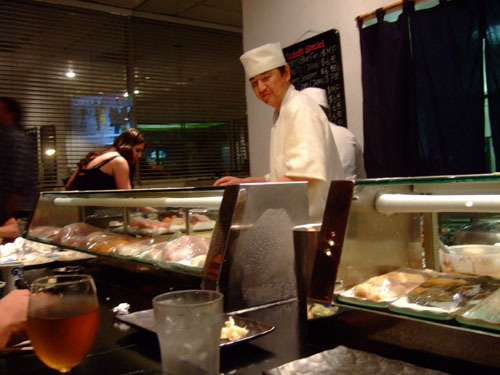 I haven't but is on my to dine list when I come to LA - Urasawa, Kappo Ishito, Kappo Sui, Kiwami's omakase room, Mori sushi, Izayoi, Sushi Nosawa and Hokusai × 4 ( sushi, kitchen, mix and land&sea. 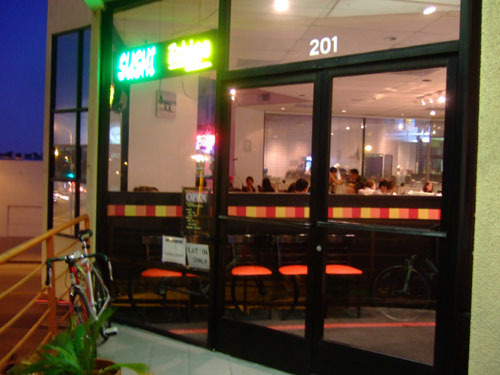 restaurant offer 4 tasting), Sushi go 55,Sushi Gen and Go Mart. In between i will fly p.s. to NYC to dine Masa and Sushi Yasuda. You have a nice selection of places there, but why only Japanese? We can talk about organizing something together when August draws nearer. that just a week and half of list. Motif　Restaurant, Jar, Angeline Osteria, Chateau Marmont, Belvedere's wine room,French Laundry(since chef lee left and chef Tim Hollingsworth　take over, should be interesting) . Interesting selection; I was not familiar with Motif, and Marmont isn't a place people go to for the food. I am very curious about French Laundry; Corey Lee is leaving sometime in August I believe, so are you going before or after the transition? As for the 5x5, I was able to attend Providence last week. I had a pretty good time there. I will not however be able to do Melisse or Grace, as I will be in Chicago and Las Vegas, respectively, on those dates. u are sight. it more of a fellow up on chateau marmont's buttermike fried chicken. I recall when Mohammad Islam was there the restaurant was way up, the chicken is one of his signature dish along with other dishes make u home away from home , I was hoping Carolynn Spence has keep that dish the way it is . I been told since her promotion she start cooking in the office rather than kitchen, hence the downhill of the restaurant. 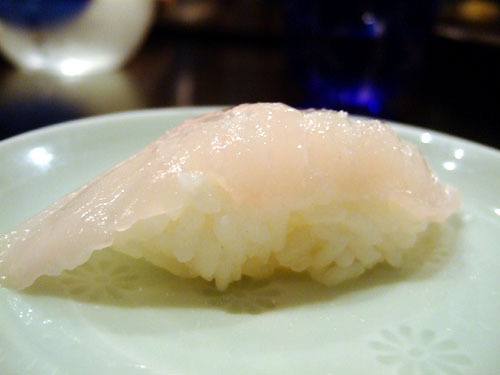 Per the meun, your butterfish 銀だら are acturlly sablefish/ black cod. Ah thanks. I've made the correction. Sorry, it took me a while to found the answer reguarding Tai and Tai from JP. Per menu - the first one one the list are red snapper(たい), the second list are red snapper/jnp(たい). The funny thing to me is they both list as たい which is one way to write 鯛(たい,タイ)(Tai) which translate to sea bream. (http://www.wisegeek.com/what-is-sea-bream.htm). even through is pricy, but it is no where close to be red snapper, and it is hard to notice since they belone to the same family. Here is the catch, assuming the first one one the menu are 鯛 and the second one are 真鯛 (madai) due to the "JPN" which actually mean "real snapper" in this case red snapper. 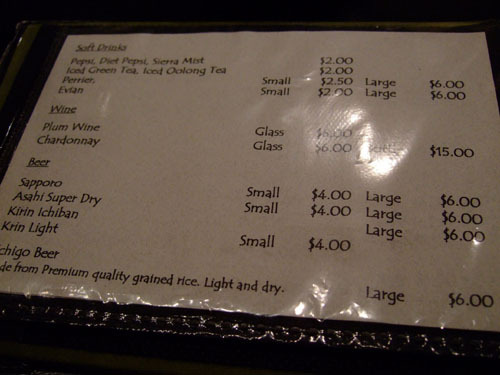 Which meanyou are having the red sea bream, and the red snapper. Dason, thanks for that clarification. I've heard many stories of red sea bream being mistakenly sold as red snapper.